Preheat oven to 350°F. Add olive oil to a large skillet over medium heat. Add onion and garlic and cook until translucent, about 5 minutes. Meanwhile, start heating a large pot of water for cooking the pasta. Add ground beef to the skillet and cook, breaking up the beef as it cooks, until the meat is well browned, another 8-10 minutes. Season with salt and pepper. Stir in ketchup and 1 1/2 cups cheddar cheese at the very end and remove mixture from the heat. Working one at a time, stuff each shell with a generous spoonful of cheeseburger filling and place in a large baking dish. Repeat process until you’ve used all of the cheeseburger mixture. Add 1/4 cup of water to the baking dish and cover it tightly in foil. Bake shells for 15 minutes. Remove foil, sprinkle the remaining cheddar cheese over the top of the shells and bake uncovered for 10 more minutes, until cheese is completely melted. Remove from oven and garnish shells with a drizzle of ketchup and sprinkle of fresh oregano, if desired. Serve warm. 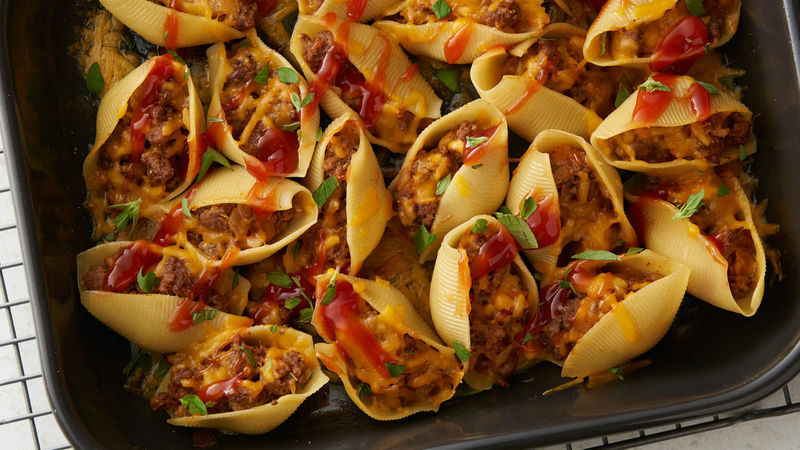 Delicious cheesy beef stuffed inside large shells for a perfect baked pasta dish. This time of year I absolutely crave baked pasta dishes. Something about the cool, crisp air and changing colors just makes me want to curl up with a glass of wine, a good book and huge dish of baked pasta. This cheeseburger stuffed shell dish is one of my new favorites. It has really great flavors, and is a fun twist on the usual Italian version. Plus, it has just a few ingredients and is SO easy to make. And what home cook couldn’t use a new idea for using up a pound of ground beef? Start by cooking some onions and garlic in a large skillet over medium heat. Then add the beef and brown it well. Be sure to break it up as it cooks and browns and stir it regularly. While the beef cooks, you can cook the shells! No tricks here. Just cook them according to the package, but be sure not to overcook them or they might fall apart when stuffing. When the beef is done browning, season it well with salt and pepper and add the ketchup and half of the cheddar cheese called for in the recipe. Stir this all together off the heat. Next, stuff a big spoonful of cheeseburger mixture into each shell and place the finished shells in a baking dish. Repeat until you are out of cheeseburger mixture. You should get around 18 finished shells. Add a little water to the baking dish (1/4 cup) and cover it tightly with foil. Bake it for 15 minutes at 350°F. Then remove the foil and add the rest of the cheese to the dish, and return it to the oven for 10 more minutes to melt the cheese. To really play up the cheeseburger flavors, add a drizzle of ketchup and a sprinkle of fresh oregano on top. Enjoy!